By Heather Lipp, J. Morris Flowers, all Photography by Lisa at Lovesome Photography. 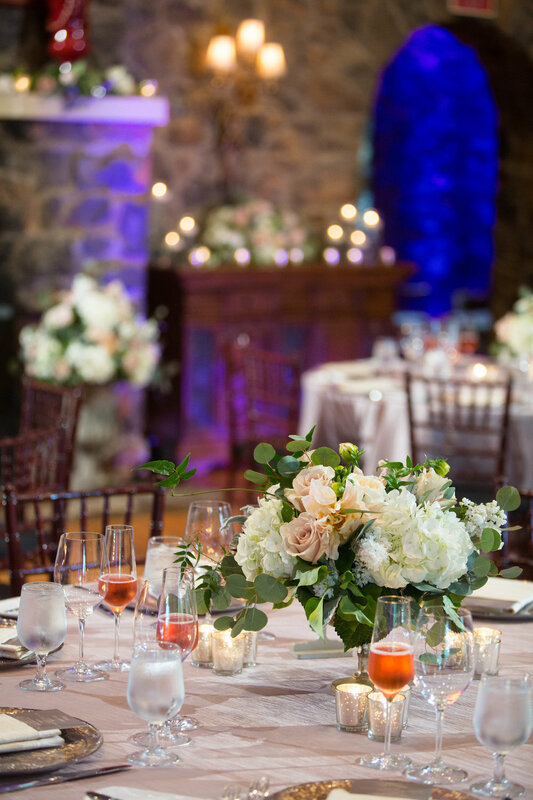 The focal pieces Kerry and Tim designed created a classically romantic setting for their ceremony, moved inside due to an unexpected chill. 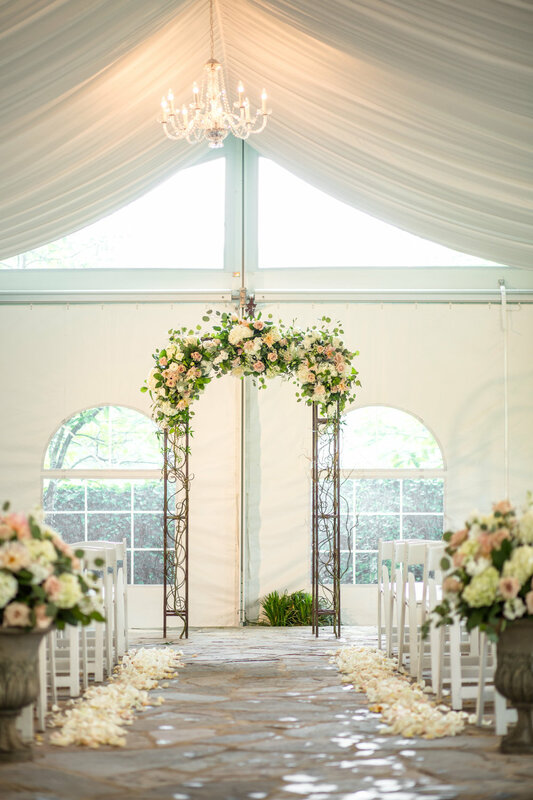 The white tent and field stone patio offered a lovely contrast of textures for the arch, urn arrangements and rose petals sweeping the sides of the aisle. As the day continued, each moment of careful planning unfolded into a lovely weekend getaway for family and a perfect beginning for this couple. 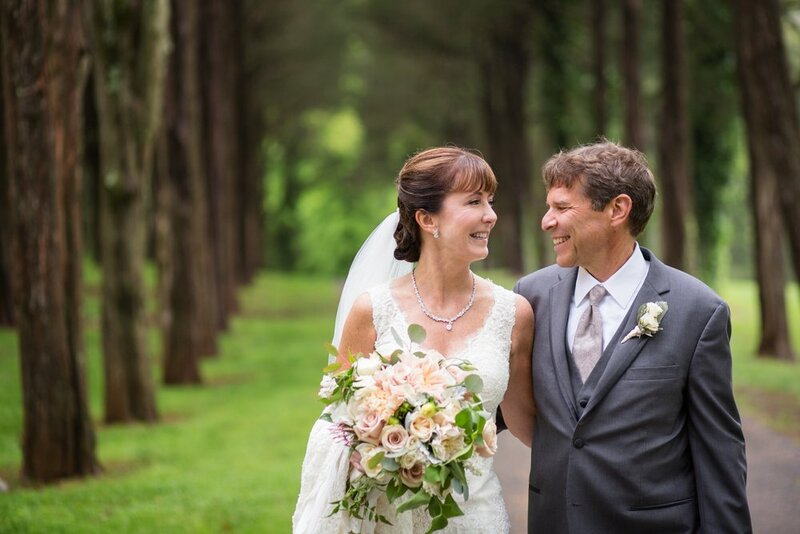 “Poplar Springs has been recently renovated,” according to Kerry, “and they do all the catering themselves including their own cakes.” The food was organized by stations with a special allergy-friendly cake for Kerry and Tim. The new family, Photography by Lovesome Photography. Kerry has four children; Tim has three. They wanted all of the kids to have a meaningful role in the wedding without creating a big wedding party. Kerry’s daughter stood up for her as maid of honor and her son walked her down the aisle. One of Tim’s sons stood up for him, two of the kids read during the ceremony and the others gave toasts. Kerry shared her feelings about why this weekend event was so important to the couple. “We had guests who were even surprised that we were doing the whole wedding thing. But, I wanted to mark this day for everyone. Here we are, combining two families, and we wanted to highlight that. The weekend wedding was great for us, our families didn’t know each other well and it gets much more complicated with extended family. We got to hang out together for a weekend and get to know each other in a way that we had never experienced before." Wisps of trailing Jasmine in this bouquet with Cafe au Lait Dahlia and O'Hara Garden Roses. Photography by Lovesome Photography. As for the flowers, Kerry chose colors that her eye was drawn to in photographs, narrowing her choices down to dustier shades. 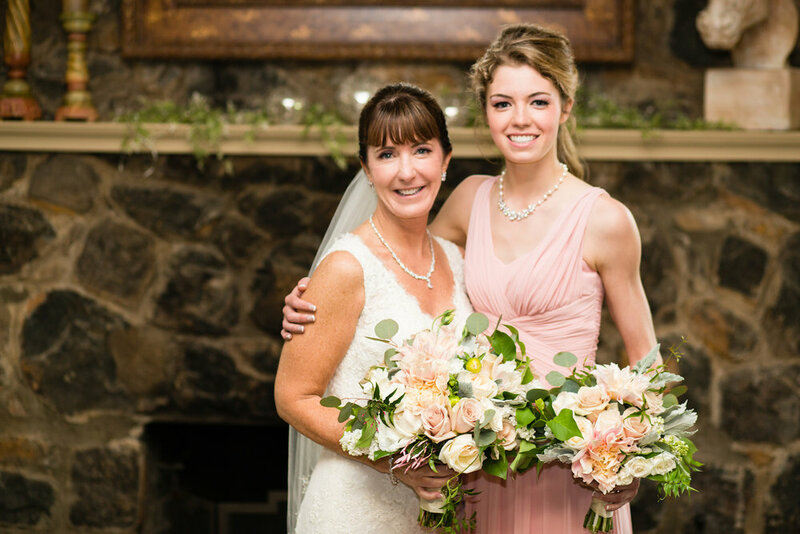 The pink her daughter wore worked for Kerry because it was a muted shade and it was a great color on Jenna. She eventually chose dusty pink, peach, ivory and a light-blue green that she discovered in Dusty Miller (greenery variety). 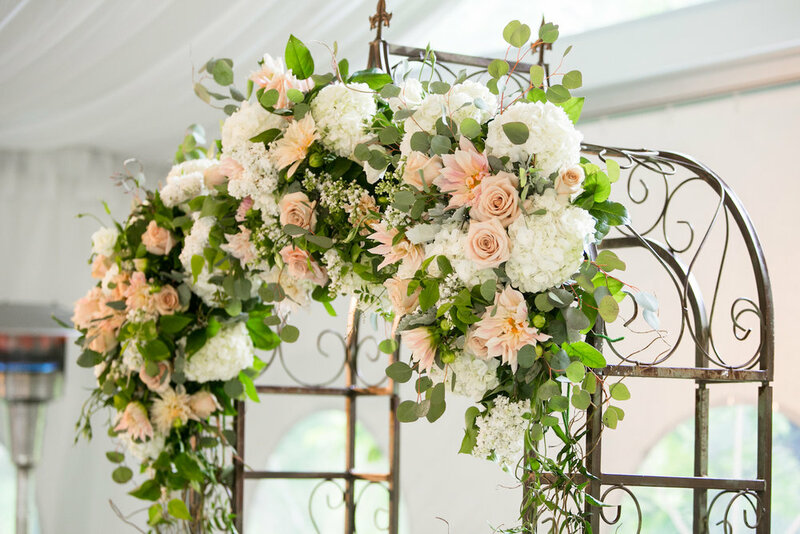 Arch flowers include Cafe Au Lait Dahlia, Quicksand Roses, White Lilac and Hydrangea, Dusty Miller, Silver Dollar Eucalyptus and Jasmine. Kerry, Tim and Katie spent a lot of time focusing on the design details for the arch and the rest of the ceremony; including the placement of the petals. The urns and arch were filled with her theme flowers: Café au Lait Dahlia, Quicksand Roses, White Hydrangea, Dusty Miller, Silver Dollar Eucaplytus and Jamine Vine. The Rose petals carefully spread on the sides of the aisle created a continuity between the larger ceremony focal points. According to Kerry, Tim really wanted the arch to be rounded. 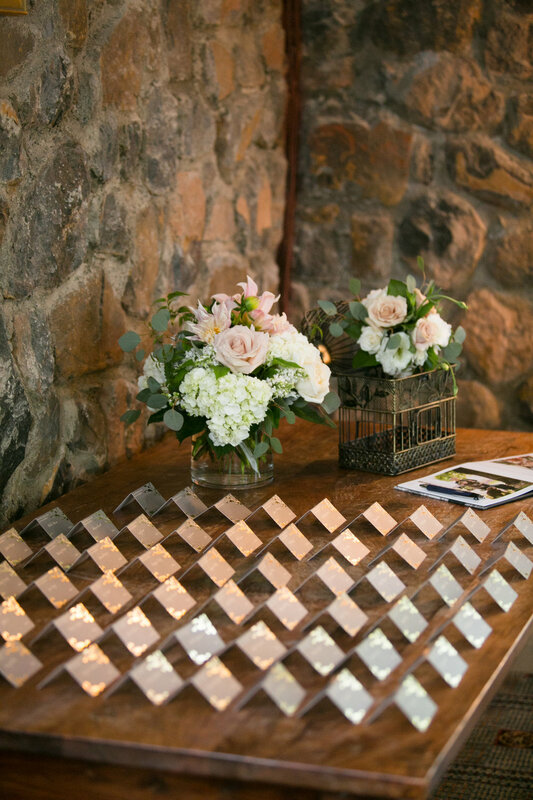 “A rounded arch spoke to him and it was perfect, we wanted to do it right and make it a real centerpiece.” Kerry also ordered champagne colored shawls from Etsy and put them in a box for her guests to wear. Call it women’s intuition, but they were necessary and a big hit with many women in attendance. Kerry and Tim really appreciated the help of their wedding coordinator, Lynn Liannizzi, from the Finer Points.